Jonathan Coulton, the composer of 'that-song-from-Portal' and Rock Band fan favorite, has converted his song 'Future Soon' for the upcoming Rock Band Network. If there were a gamer nation, Jonathan Coulton would probably write its national anthem. Having written possibly the most memorable song in gaming and contributed four pieces of official DLC for Rock Band - not bad for a guy writing funny songs on the internet - he's now popping up to help Harmonix demonstrate the process of getting a song onto the Rock Band Network at the Rock Band panel at PAX. We already knew that converting a song with the program Reaper was a lengthy process, but Coulton's song 'Future Soon' took two days to convert, due to it having so very many chords in it. It was then imported into the second program Magma where the art, genre, price - 240 points in this case - and preview were set. 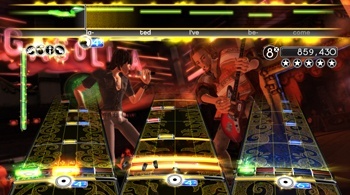 The song was then imported into Rock Band 2's audition mode, where a group of enthusiastic fans took the song out for a spin. Given that Coulton had Harmonix staff backing him up, it seems pretty likely that 'Future Soon' will be making an appearance on the service when it launches in November, which will make a number of fans - myself included - very happy indeed. So wait, is the news that JoCo is awesome? I knew this already. But good to hear. Rock Band 2 is becoming an attractive package. Old. I knew this weeks ago. Yeah this may revive my interest in Rock Band, well only if he puts Betty and Me on there, now thats an awesome song. I do enjoy JoCo's work. Code Monkey was almost like my anthem for a while. Tell me when they add RE: Your Brains to Left 4 Dead 2. That'd be awesome. "perfecting my warrior robot race... building them one laser gun at a time..."
Amazingly edited/constructed WoW machinima for Future Soon here. "Code Monkey get up get coffee... code monkey go to job..."
Awesome AMV set to it here. I don't even know the anime it's set to (Black Heaven) and it's still awesome. you do know spiff has done all popular Coulton songs right? I was more hoping Code Monkey would make it on there, even though it is really simple as a song.